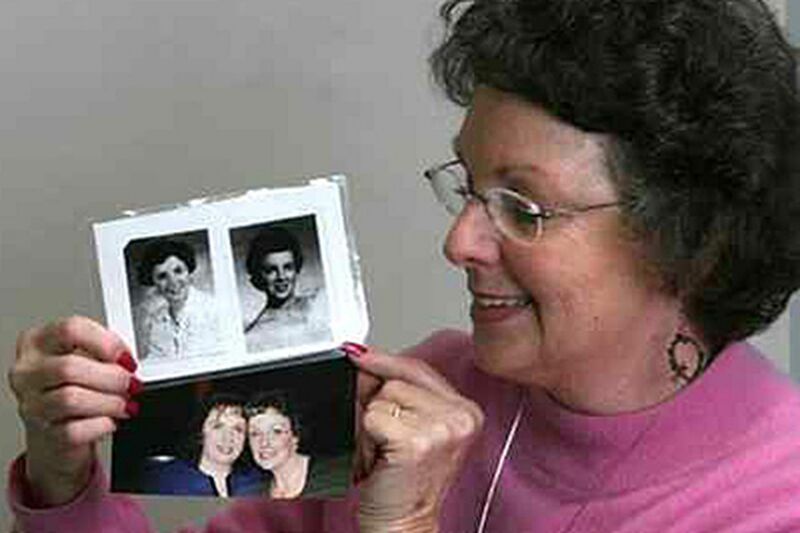 Judy Foster of Randolph, N.J., with pictures of her daughter (left) and herself at 17. After she gave birth she gave up the child for adoption. They were reunited decades later. For most of her adult life, Judy Foster couldn't answer the question "Do you have children?" without feeling a lump in the pit of her stomach. That's because Foster, who says she was date-raped, surrendered her infant daughter for adoption in 1961. The father wanted to get married, but Foster, who was 19, didn't want a family that began with a violent act. She prayed to God for help and eventually gave her baby up. Over the years, Foster, now 67, often thought about her daughter, secretly telling her that she loved her and hoped someday to meet her. Twelve years ago, she hired a private investigator, and within weeks, Foster and her daughter - her only child - had a joyous reunion. "We fell into each other's arms, and it was the best moment of my life, to be able to hold my daughter again," said Foster, choking with emotion despite having told the story many times. Foster, of Randolph, Morris County, is among those pushing for a bill that would allow adult adoptees access to their birth certificates, including the names of their biological mothers. She hopes the legislation will help give more birth parents and adult adoptees the sense of closure she now has. On Monday, the Assembly Human Services Committee approved the bill by a 6-0 vote with four abstentions after five hours of sometimes emotional testimony. Assembly Speaker Sheila Oliver (D., Essex) has said she supports the measure and will post it for a floor vote in the Assembly, the closest it has been to becoming law. Advocates in New Jersey have worked more than 30 years to get adult adoptees access to information about their births. Bills have passed in one house of the Legislature or the other, but never both. Former Assembly Speaker Joseph J. Roberts Jr. (D., Camden), who retired in January, blocked the bill in the past, but Oliver's support has its proponents cautiously optimistic. The Senate approved the bill by 27-10 in March. Gov. Christie has not yet said where he stands on the bill. New Jersey could become the ninth state to guarantee adult adoptees access to birth information. Kansas and Alaska always have allowed such access and Alabama, Delaware, Maine, New Hampshire, Oregon and Tennessee have granted adoptees some access to records in recent years. Pennsylvania allowed adoptees access to their original birth certificates until 1985. Under the New Jersey bill, adult adoptees would be given access to their original birth certificates and family medical history. Birth parents of babies adopted in New Jersey would have one year from enactment of the law to notify the state if they did not wish the information to be given to their children. During that time, adult adoptees could obtain nonidentifying medical information including family medical history from adoption agencies, which already is common, experts said. Going forward, birth parents who put a child up for adoption would be asked if they would prefer to be contacted directly, through an intermediary, or not at all. Those who chose not to be contacted would be required to submit medical and cultural information. All adult adoptees whose birth parents did not opt out would have access to their birth certificates. Proponents of the bill argue that adoptees have a right to know more about their origins. "For most of us, having answers to the questions of identity and heritage is a source of comfort and cultural pride," said Sen. Joseph Vitale (D., Middlesex), a sponsor of the bill. "For adopted New Jerseyans, many will never get answers to the key questions of who they are and where they come from under the current records access regulations." Opponents argue that the state should protect the rights of birth mothers who were promised privacy by adoption agencies. Patrick Brannigan, executive director of the New Jersey Catholic Conference, told the Assembly Human Services Committee on Monday that the state should honor the privacy of birth parents who were promised or requested it. "It is a small minority of birth mothers who want and need their privacy. Why don't we respect them?" he said. Deborah Jacobs, executive director of the American Civil Liberties Union of New Jersey, also argued against the bill, saying that it violated the rights of birth parents by stripping away a right to confidentiality that has stood in the law for decades. She said that women who did not want to come forward themselves had sent her anonymous letters urging her to speak out against the bill. The Republican legislators who abstained in Monday's vote said that while they agreed in concept with the bill, they thought it needed tweaking to accommodate birth mothers who wish to not have any information released. Some argued that birth parents should be required to notify the state if they are willing to be contacted rather than have the state ask them. Proponents of the bill argue that mutual-consent registries accomplish little because so few people bother to register. Some who testified said that regardless of what lawmakers decide to do, technology and culture are moving in the direction of openness. Open adoptions, where birth parents retain the right to have contact with their children, have become more common in recent decades, and the Internet and other technologies have helped to facilitate reunions. Foster was among the birth parents who testified in favor of the bill on Monday. She recalled the lengths she took to hide her past, including not telling her husband until 10 years after their wedding that she had given a baby girl up for adoption. She hopes the legislation can help others unburden themselves of the shame that surrounded adoption. "The people who oppose this don't see the need to throw off the mantle of shame that we've carried for so long," Foster said. "There are mothers who are so frightened, not that their children will find them, but that society will judge them. . . . This is to me a basic human right, for a mother and a child to know one another."